Home > Bacteria & Antibiotics > What is MRSA? 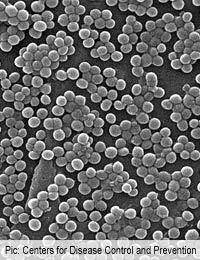 MRSA is an acronym used to describe a strain of Staphylococcus aureus that is resistant to the killing effect of the antibiotic methicillin. Methicillin-resistant Staphylococcus aureus is often called a ‘superbug’ because it is very difficult to treat and it causes a huge number of infections every year in hospitals all over the world. Staphylococcus is a very common bacterium that is present in the upper respiratory tract and on the skin of many people. In most cases, it does not cause disease and is considered to be a commensal bacterium. However, the strains of Staph aureus that are carried by some people are pathogenic in others, particularly when the bacteria are introduced into a wound. It is possible for a healthcare worker in a hospital to carry Staph aureus without any ill effects but then to pass it onto patients who have recently had serious operations, causing a major post-operative infection. How Did Methicillin Resistance Arise? All strains of Staphylococcus aureus were sensitive to penicillin when it was first manufactured and used to treat patients in the early 1940s. However, misuse of antibiotics quickly led to the development of resistance. Some strains obtained the gene for an enzyme that broke apart the penicillin molecule. By the end of the 1950s, virtually all strains of Staph aureus found in hospital patients were completely resistant to penicillin because of their production of penicillinase. Researchers in the late 1950s and early 1960s tackled this situation by developing an alternative antibiotic – methicillin. This is in the same class of antibiotics as penicillin and it prevents bacteria from making new cell walls, just as penicillin does, but the molecule has a slightly different structure. This means that the penicillinase enzyme cannot attack it so bacteria that had developed resistance to penicillin were quickly killed by methicillin. This strategy worked well and strains of Staph aureus remained treatable by methicillin throughout the 1960s and 1970s. During the next decade, strains of methicillin resistant Staph aureus began to appear but the situation really became serious in the 1990s. Just as penicillin strains of the bacterium had done in the 1950s, strains of methicillin resistant Staph aureus gained the upper hand and caused widespread epidemics in hospitals throughout Europe and North America. The term MRSA technically means methicillin resistant strains of Staph aureus but is today used to describe Staph aureus that are resistant to all penicillin-like antibiotics. Staphylococcus epidermidis bacteria, which are also common on the skin, have also gained methicillin resistance from their close relatives via plasmid transfer and are now a significant problem in intensive care units and surgical wards. These bacteria are now known as MRSE. MRSA and MRSE have caused huge waves of infection in hospitals and are now considered a major risk for anyone entering hospital for an operation, particularly if they are elderly or weak from an underlying illness such as cancer. In recent years, hospitals have refocused on cleanliness and basic techniques such as handwashing, which help to reduce transmission of bacteria, and cases are currently declining. In patients, MRSA can cause infection in any type of wound, but deep surgical wounds such as those necessary in a hip replacement operation or a heart or kidney transplant are a particular risk. Transplant patients are also treated with immunosuppresive drugs, which damp down their immune system so that they accept the graft better. However, these also reduce the body’s ability to fend off bacterial infections, so transplant patients are among the most vulnerable to MRSA. MRSA can also infect the skin of frail and elderly patients, or those who stay in bed for long periods. People with diabetes or varicose ulcers can easily become infected in breaks in the skin. The bacteria also take advantage of entry points into the body that are created by treatments such as injections and the introduction of IV lines, catheters and ventilation tubes. A local infection in an IV line can quickly become life threatening as the bacteria gain direct access to the bloodstream, causing septicaemia. Even if this does not happen, the bacteria can track their way deep into the body but more slowly and can set up deep abscesses in the tissues and major organs. These are difficult to detect until the patient becomes extremely ill with a high fever, shock and a high white cell count in their blood. Intubation of patients in intensive care units can introduce MRSA directly into the lungs, where it causes a highly fatal form of pneumonia. This illustrates the opportunistic nature of MRSA – this is one of the very few circumstances in which Staph aureus can cause a lung infection. Why Can't Antibiotics Cure the Common Cold? How Do Antibiotics Affect Friendly Gut Bacteria?